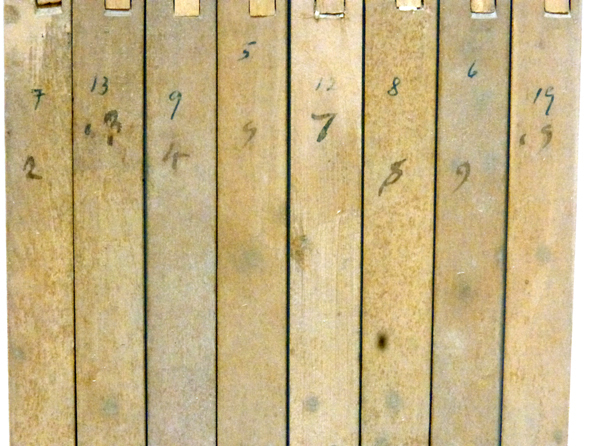 The numbering and the construction of the jacks of the Franco-Flemish harpsichord were compared with those of the jacks made by other French eighteenth-century makers. 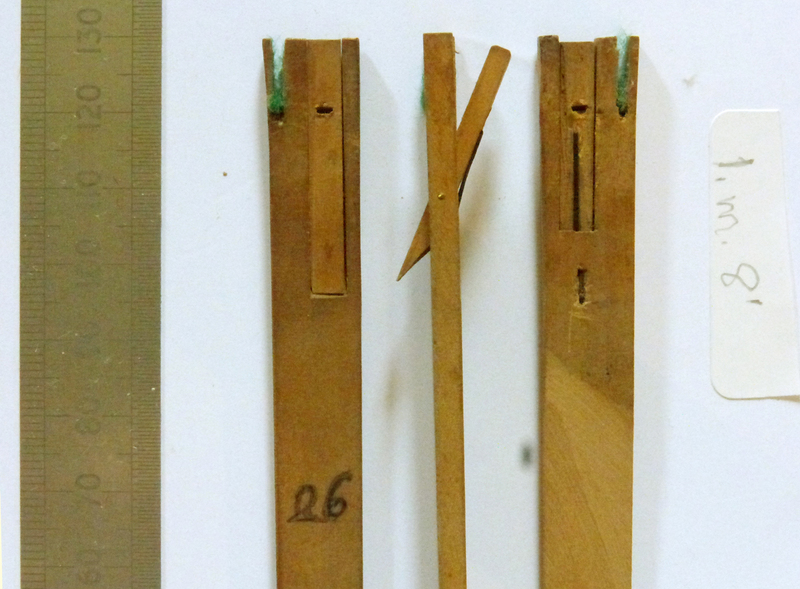 The only surviving Blanchet jacks - perhaps the only ones in the world - that are similar to these are those on the 1733 François Étienne Blanchet double-manual harpsichord in the Château de Thoiry in the province of Yvelines near Paris. 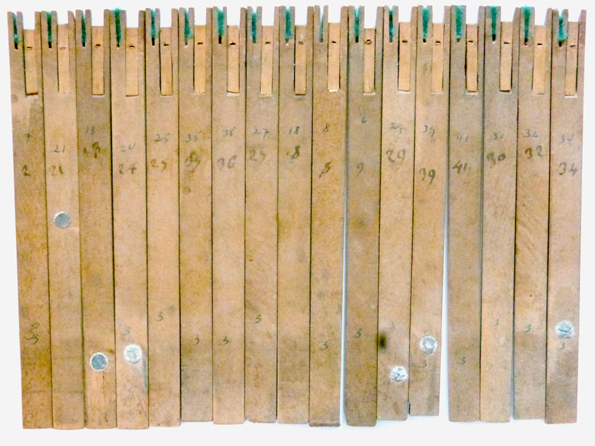 The construction of the jacks in the Thoiry Blanchet instrument is identical to that of the jacks in the Franco-Flemish harpsichord. The exact position of the axle pin for both the 8' and 4' jacks, the angle of the bottom of the tongue, the angle of the bottom of the tongue slot, the amount the tongues are recessed below the top of the jacks for both the 8' and 4' jacks, the size of the tongues and tongue slots, the position and angle of the bristle hole, etc. are all exactly the same in the jacks of the Thoiry Blanchet and in the Franco-Flemish harpsichord. 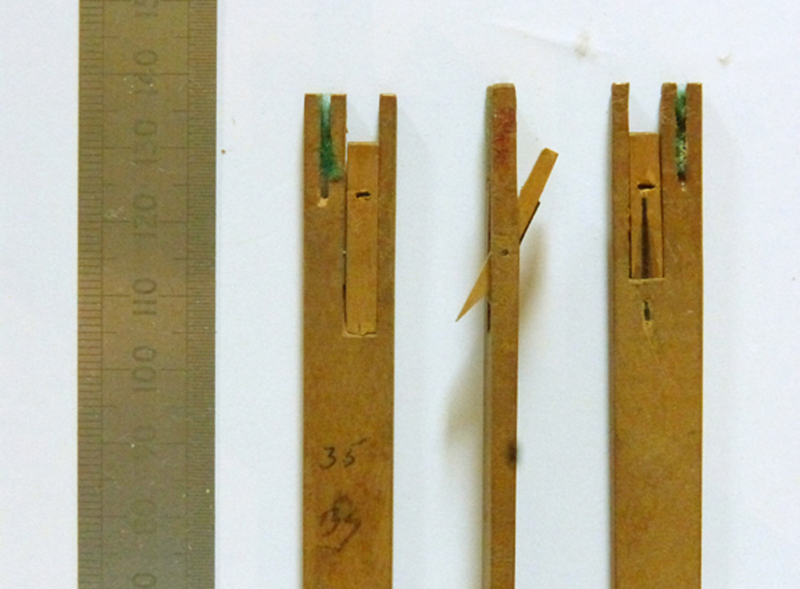 This indicates that precisely the same jig was used to make both sets of jacks and that they came from the same workshop. Also the numbering has clearly been written by the same hand in both instruments except, inexplicably, for the number '8' which is quite different. The keyboards of the 1652 Couchet double-manual harpsichord (converted from a single-manual harpsichord) in the Musée de la Musique are reputed to be by Blanchet. Indeed the hand of the numbering of the keys is the same as that of the jacks and keys of Thoiry Blanchet and the jacks of the Franco-Flemish harpsichord, AND the '8' on the 1652 Couchet keyboards is made in the same way as the '8' on the Franco-Flemish harpsichord. This therefore simultaneously proves both that the ravalement of the Franco-Flemish harpsichord was, indeed, carried out by Blanchet and that Blanchet made the keyboards of the 1652 Couchet in the Musée de la musique in Paris. I would like to express my thanks to Alain Anselm, Le Compte de La Panouse and to Jean-Claude Battault for their generous help and co-operation in my examination of the instruments in their care.